Why should you choose 365mc? All types of obesity and body line consultation and procedures are available at 365mc, by state-of-the-art procedures such as bariatric surgery, full body liposuction Plastic surgery, calf reduction, diet therapy, behavior modification, medication therapy, injection therapy and mechanical therapy. You can easily meet 365mc anywhere for Korean Plastic Surgery Liposuction through our 20 nationwide branches in the main cities such as Seoul, Busan, Incheon, Daegu and Daejeon, all having identical prices and a standardized service and program. 365mc has about 200 staff members including 30 obesity specialists of former U.S. Cleveland Clinic staffs and university professors, professional diet therapist and physiotherapists, giving high satisfaction from consultation to procedures and prescriptions. Undoubtedly you will get the best Korean liposuction Doctors with exceptional experience in liposuction Korea. 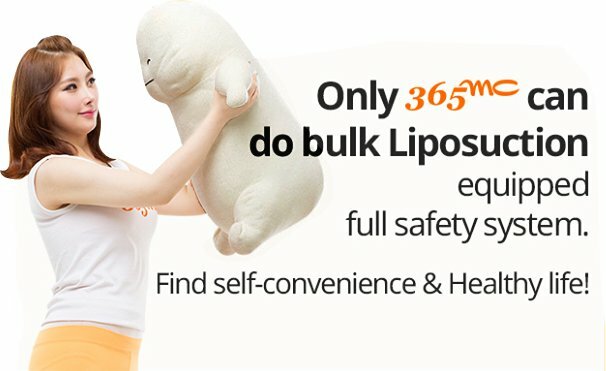 365mc is not only recognized for Liposuction in Korea, but we are also renowned overseas with our superior obesity surgery levels, giving satisfaction through pricing and high level medical services, globally promoting an outstanding medical reputation of Korea with our best Korean liposuction Doctors. 365mc is focusing on one problem, obesity. We construct a total obesity treatment system with our knowhow acquired through various researches and clinical cases. Our Korean Plastic Surgery Liposuction Prices & cost are customized and depend upon treatment with most advanced machineries. As a customer oriented obesity treatment center, we possess the most cases among Korean obesity clinics and a daily average of over 1,000 patients visit us putting their trust in 365mc’s treatment effect as we provide the the best treatment of Full Liposuction in Korea. Through our independent R & D center, 365mc is spurring on obesity related researches such as treatments and standardization, clinical data analysis for weight loss customers, and we also publish many obesity related thesis in international journals from the research of our Best Liposuction Doctors in Seoul, South Korea. What is special about 365mc Liposuction? Our Best Korean Liposuction Doctors with thousands of liposuction success cases perform surgeries themselves. 365mc Doctors performed live Korean liposuction plastic surgery with the world’s great liposuction/aesthetic scholar Dr. Seckel of Harvard Univ. Dr. Seckel and praised us for our world class level of facilities and system, and for our high skilled clinicians. 365mc performs safe surgeries with residing anesthetic specialists and various advanced medical equipments such as whole body anesthesia devices and CPR equipments. 365mc is the very first and the only obesity center of full body Liposuction in Korea to adopt and work with a state-of-the art 3D body type analysis system. You can check the front, rear, left and right views of your body through a 3D image, enabling a systematic diagnosis for fat deposited parts that require intensive care. For Full Body Liposuction Cost in Korea, Contact us. Korean Liposuction Plastic Surgery is not just a suction surgery to reduce the amount of fat. 365mc considers the cosmetic part of the customer’s body figure and performs the surgery to make the most beautiful body line for each part. We have a special team exclusively for foreigners, for interpretation and after surgery care. Visiting on the very day of South Korea liposuction cost is available, as we also provide consultation before the procedure via telephones and video meetings. You can be discharged on the day of the liposuction with no inconvenience in your daily life.